At work we were offered four tickets to a show and I grabbed them because I always enjoy theater, especially if it’s free. 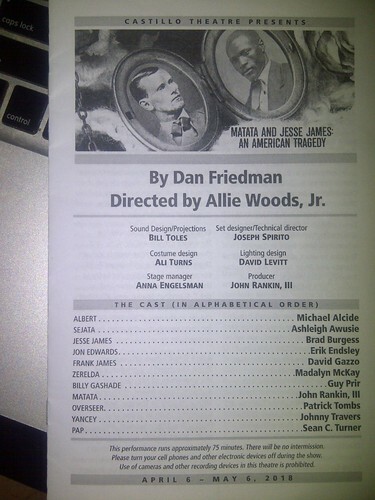 The off-Broadway play was Matata and Jesse James: An American Tragedy at the Castillo Theatre, west of Times Square. I got there just before they opened the house. We were told not to cross the stage, which was the floor in front of us. There were two rows of folding chairs and then one row of bleachers on each side of the room. If you went in the other door, then you would have been sitting opposite me. Around three sides of the room was a wooden boardwalk and I noticed it was behind me but not behind the seats on the opposite side. So some of the action would be taking place behind me. In the center of the floor was a column and it also served to separate what looked to be two homes – one on our left and another on our right. Each home was a table and chairs on top of some flooring and tree stumps in front of them. Above the boardwalk was a backdrop of open sky with a view of some land just above the walkway. The color was white and brown – the brown of old photographs. Actors entered from several corners and sometimes walked along the boardwalk. Several times they entered and exited right next to me. It is a small space and it is difficult not to feel like you are in the play. I do not know how long Dan Friedman took to write this play but, although it takes place during and after the Civil War, it is contemporary in many ways. I felt the play could have used some workshopping because it was too on the nose and the ending was abrupt and at loose ends. Perhaps it was hurried because of what it says about what is going on today. It starts in 1861 – Jesse (Brad Burgess) and Frank (David Gazzo) James, Billy Gashade (Guy Prir), and Zeralda James (Madalyn McKay) are discussing joining the war and fighting for the South and Zerelda is encouraging her sons to join. The scene shifts to other side where slaves Matata (John Rankin III), his wife Sejata (Ashleigh Awusie), Albert (Michael Alcide), and Pap (Sean C Turner) are also discussing the war and what it might mean for them. Matata wants to escape and fight for the North. There is violence when the Overseer (Patrick Tombs) enters and tries to separate Sejata from Matata. Then we shift to 1865 and the James boys (especially Frank), their mother, and Billy are still fighting the war and cannot accept that the South lost. They try to come up with ways to keep the fighting going in Missouri and hope that other states will join. Eventually Jesse organizes a gang with his brother, Billy, and Yancey (Johnny Travers) (who was never sure the South was on the correct side of the fight) to rob banks – again with their mother’s encouragement. Matata saves money working as a blacksmith and buys a farm (many of the farms have been foreclosed) from Jon Edwards (Erik Endsley). Albert is a preacher and Pap is just happy enough to have lived long enough to be a free man. If you read or know the history of the James family, you will find discrepancies with what happens in the play and what happened in real life. It is a “history play” and not a history text. In the 1870s, Jesse is deep into bank robbing and giving money to the poor. He saves a widow’s (McKay) farm but then steals the money back from the banker (Endsley). The gang hide out at Matata’s farm (with his permission) despite Frank not wanting any help from a black man. When Matata is in financial trouble, he seeks help from Jesse. Will Jesse help a black man? Yancey is the conscience of the group and finally quits the gang while Frank represents the South that will not give up on the idea that white men are superior to blacks and that blacks should remain slaves. Jesse does not know why they are fighting for keep slavery when they work their farm themselves and are and will remain poor. There were some traditional songs, sung beautifully by members of the cast – “To Arms in Dixie,” “Didn’t My Lord Deliver Daniel,” “I’m a Good Ole Rebel,” “O Death,” “Keep Your Eyes on the Prize,” “Red River Blues,” and “You’ve Been Gone Too Long.” Prir played guitar and Endlsey played (I think) banjo (or maybe guitar). All the actors were excellent but some were a little too pretty for me. Rankin’s dreads were covered in a big scarf in a bun behind his head and the ball of hair was as big as his head and it was distracting. Since the audience was on both sides, sometimes the actors would speak to one side or the other. It was difficult for me to hear them when they spoke facing opposite me. It was best when they all spoke out into the middle of the stage, rather than facing either audience. A couple of unexpected moments – the cheer from a group of black people in the audience when the overseer was killed and an Asian woman, who kept laughing at inappropriate moments. All the tech people did a good job – Bill Toles (sound design/projections), Joseph Spirito (set designer/technical director), Ali Turns (costume design), and David Levitt (lighting design). You could see the elastic of Frank’s leather pants just inside his boots – they should have sprung for more material for his pants. Allie Woods, Jr did a good job also except for the things that I mentioned. I also might have had Frank express his anger in a less loud way.